After the Manchus invaded China, the military of their newly founded Qing dynasty all adopted Manchu archery equipment. The Manchu war arrow thus because the standard military arrow of the Qing imperial army. This large and imposing war arrow is often compared to a small spear. They were long and heavy arrows, of standardized length, with a flattened triangular point on a long and slender steel neck. The Manchu bow is completely designed around such arrows, and it is the only bow that can shoot them as fast as it can for a given poundage. This bow-arrow combination was designed to deliver the greatest possible punch to the target, demobilizing it if not killing instantly. This focus on hard hitting single shots emerged from the Manchurian large game hunting tradition, where downing an animal with one shot was preferred over the ability to cast many lighter arrows. As these arrows are so large and heavy, not many of them could be carried. As a consequence, they really had to make their shots count. 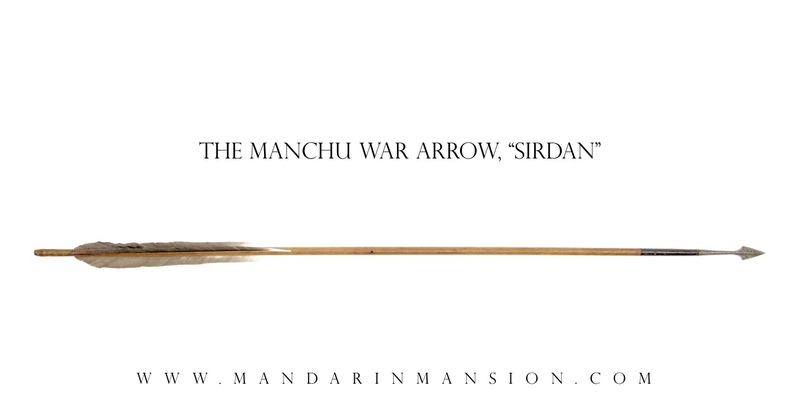 Read all about Manchu war arrows on the Fe doro - Manchu archery website. A heavy Manchu war arrow, of standardized length. Made with a large wooden shaft that tapers towards both ends, only to flare out again at the nock. Nock is wrapped with sinew, in-turn covered with birch-bark. The tanged point is inserted at the front, wrapped with sinew and covered with black peach bark. Such a construction is incredibly strong, I've shot accurate replicas of such arrows into walls and they remained intact where a socketed arrowhead would break right behind the socket. It has the characteristic Manchu war arrowhead: of triangular in shape and deliberately not sharpened to create more of a "punch" at impact. All these elements are according to Qing military regulations. Some losses to the birch bark and peach bark, which is often the case because most of these arrows we find today were taken back from battlefields by European soldiers as war trophies. This example has a small hole in the shaft that is blackened, probably where a little nail went through for an old wall-mount. 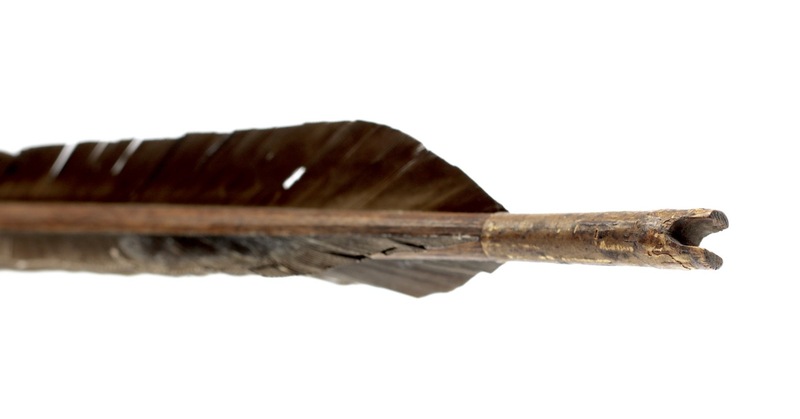 Over time the arrow had lost its feathers so I re-fletched it, using traditional glue and methods. I aged the feathers as to blend in with the old shaft. A rare chance to own a real Manchu war arrow.